Summary: Findings have implications for learning methods and memory consolidation. A new study in mice shows this link may be possible. Attention-grabbing experiences trigger the release of memory-enhancing chemicals. Those chemicals can etch memories into the brain that occur just before or soon after the experience, regardless of whether they were related to the event, according to researchers at UT Southwestern Medical Center’s Peter O’Donnell Jr. Brain Institute. The findings, published in Nature, hold intriguing implications for methods of learning in classrooms as well as an array of potential uses in the workplace and personal life, researchers said. The trick to creating long-lasting memories is to find something interesting enough to activate the release of dopamine from the brain’s locus coeruleus (LC) region. 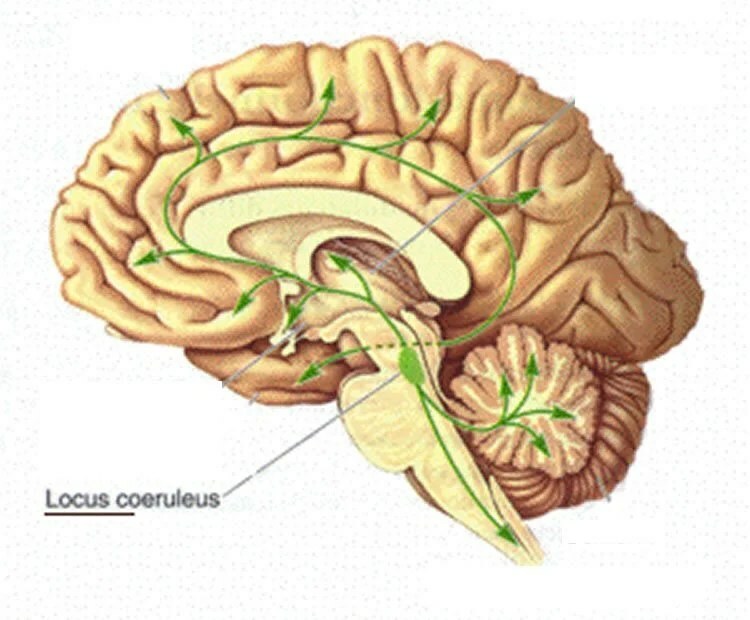 “Activation of the locus coeruleus increases our memory of events that happen at the time of activation and may also increase the recall of those memories at a later time,” said Dr. Robert Greene, the study’s co-senior author and a Professor of Psychiatry and Neurosciences with the O’Donnell Brain Institute. The study explains at the molecular level why people tend to remember certain events in their lives with particular clarity as well as unrelated details surrounding those events: for instance, what they were doing in the hours before the Sept. 11, 2001, terrorist attacks; or where they were when John F. Kennedy was assassinated. But life-changing events aren’t the only way to trigger the release of dopamine in this part of the brain. It could be as simple as a student playing a new video game during a quick break while studying for a crucial exam, or a company executive playing tennis right after trying to memorize a big speech. “In general, anything that will grab your attention in a persistent kind of way can lead to activation,” Dr. Greene said. Scientists have known dopamine plays a large role in memory enhancement, though where the chemical originates and how it’s triggered have been points of study over the years. Dr. Greene led a study published in 2012 that identified the locus coeruleus as a third key source for dopamine in the brain, besides the ventral tegmental area and the substantia nigra. That research demonstrated the drug amphetamine could pharmacologically trigger the brain’s release of dopamine from the LC. The latest study builds upon those findings, establishing that dopamine in this area of the brain can be naturally activated through behavioral actions and that these actions enhance memory retention. The new study suggests that drugs targeting neurons in the locus coeruleus may affect learning and memory as well. The LC is located in the brain stem and has a range of functions that affect a person’s emotions, anxiety levels, sleep patterns, memory and other aspects of behavior. The study tested 120 mice to establish a link between locus coeruleus neurons and neuronal circuits of the hippocampus – the region of the brain responsible for recording memories — that receive dopamine from the LC. One part of the research involved putting the mice in an arena to search for food hidden in sand that changed location each day. The study found that mice that were given a “novel experience” — exploring an unfamiliar floor surface 30 minutes after being trained to remember the food location — did better in remembering where to find the food the next day. The trick to creating long-lasting memories is to find something interesting enough to activate the release of dopamine from the brain’s locus coeruleus (LC) region. NeuroscienceNews.com image is for illustrative purposes only. Researchers correlated this memory enhancement to a molecular process in the brain by injecting the mice with a genetically encoded light-sensitive activator called channelrhodopsin. This sensor allowed them to selectively activate dopamine-carrying neurons of the locus coeruleus that go to the hippocampus and to see first-hand which neurons were responsible for the memory enhancement. They found that selectively activating the channelrhodopsin-labeled neurons with blue light (a technique called optogenetics) could substitute for the novelty experience as a memory enhancer in mice. They also found that this activation could cause a direct, long-lasting synaptic strengthening — an enhancement of memory-relevant communication occurring at the junctions between neurons in the hippocampus. This process can mediate improvement of learning and memory. Some next steps include investigating how big an impact this finding can have on human learning, whether it can eventually lead to an understanding of how patients can develop failing memories, and how to better target effective therapies for these patients, said Dr. Greene. Dr. Greene and Dr. Richard G. Morris, Professor of Neuroscience at the Centre for Cognitive and Neural Systems at the University of Edinburgh, were co-senior authors of this study. Other UTSW colleagues who carried out experiments are Alex Sonneborn in the UTSW neuroscience graduate program and Dr. Caroline Smith. Funding: The research is supported by funding from the European Research Council, UK Medical Research Council, the European Commission’s 7th Framework 2011 ICT Programme for Future Emerging Technologies, Department Veterans Affairs, National Institutes of Health grant and NIDA-T32-DA7290 Basic Science Training Program in Drug Abuse. UT Southwestern Medical Center. “Researchers Identify Method For Creating Long Lasting Memories.” NeuroscienceNews. NeuroscienceNews, 7 September 2016. UT Southwestern Medical Center. “Researchers Identify Method For Creating Long Lasting Memories.” http://neurosciencenews.com/lasting-memory-method-4982/ (accessed September 7, 2016). The retention of episodic-like memory is enhanced, in humans and animals, when something novel happens shortly before or after encoding. Using an everyday memory task in mice, we sought the neurons mediating this dopamine-dependent novelty effect, previously thought to originate exclusively from the tyrosine-hydroxylase-expressing (TH+) neurons in the ventral tegmental area. Here we report that neuronal firing in the locus coeruleus is especially sensitive to environmental novelty, locus coeruleus TH+ neurons project more profusely than ventral tegmental area TH+ neurons to the hippocampus, optogenetic activation of locus coeruleus TH+ neurons mimics the novelty effect, and this novelty-associated memory enhancement is unaffected by ventral tegmental area inactivation. Surprisingly, two effects of locus coeruleus TH+ photoactivation are sensitive to hippocampal D1/D5 receptor blockade and resistant to adrenoceptor blockade: memory enhancement and long-lasting potentiation of synaptic transmission in CA1 ex vivo. Thus, locus coeruleus TH+ neurons can mediate post-encoding memory enhancement in a manner consistent with possible co-release of dopamine in the hippocampus. The cognitive and behavioral technics that use tasks to activate the locus coeruleous, for sure are the best ways to keeps a sharp brain function. But for patients with some brain disorders, as some types of neurodegenerative diseases (as Alzheimer disease, Parkinson disease) or brain trauma sequelaes, stroke sequelaes, researchers could study Acetyl L Carnitine as a support therapy to improves the locus etc. coeruleous function. 2) Article : Acetyl-l- Carnitine Increases Brain Energy Metabolism and Increases Noradrenaline and Serotonin Content in Healthy Mice”,Journal Neurochemistry International (2012) , where we can read that :”Acetyl L Carnitine (so called ALCAR) supplementation INCREASED the levels of the neurotransmitters NORADRENALIN in the HIPPOCAMPUS and serotonin in the cortex. ALCAR has potential efficacy for depressive symptoms. ALCAR supplementation in increased brain energy”. 4)”Acetyl-L-Carnitine Attenuates Homocysteine-Induced Alzheimer-Like Histopathological and Behavioral Abnormalities.” Rejuvenation Res. 2011-,Zhou and colleagues ,where we can read : “We found that the supplement of Acetyl L Carnitine could improve the memory deficits remarkably, with attenuation of tau hyperphosphorylation (and accumulation) and attenuation of betamyloid accumulation “.